Venus and Mars in the eastern predawn sky this weekend at around 3:30 a.m. local time (wherever you are). Venus is unmistakably bright. The scene does not change much in coming days. Two planets are prominent in the predawn sky these July mornings. They are brilliant Venus and the much dimmer Mars. Actually, these two planets have spent the past couple of months rather close to each other in our sky, but since late June they have gradually been pulling apart, with Venus slowly moving away to the east. Nonetheless, both planets appear in the same general region, low in the eastern sky a couple of hours before sunrise [Map]. Over these past couple of months, both planets have also been shifting east against the zodiacal constellations, and now they both can be seen against the rich backdrop of stars that make up Taurus, the Bull. Venus is the brilliant "morning star" rising in the east-northeast nearly 3 hours before sunrise. It's now also rising an hour or more before the start of morning twilight, despite being many weeks past greatest elongation (its largest angular distance west of the sun). Although it's fading a bit, this lantern-like planet is spectacular when it lifts up in the east-northeast at that lonely time of night. This most radiant of planets seems to hang at almost the same place above the dawn horizon through July and August as stars slide upward behind it. Mars, meanwhile, now rises more than 3 hours before the sun, increasing to more than 4 hours by July 31. Mars spends most of July and August masquerading as an extra "star" in Taurus. On the morning of July 14, Venus will pass 3-degrees north of the orange first-magnitude star, Aldebaran, the "angry eye" of Taurus and just one-third of a degree north of the star, Zeta Tauri on the morning of July 27 (also placing it near the famous Crab Nebula for telescopic observers. On the morning of July 13, Venus briefly appears to become a part of the V-shaped Hyades star cluster when binoculars show Taurus's less famous "eye," third-magnitude Epsilon Tauri or Ain, sitting just 0.2-degrees from Venus. 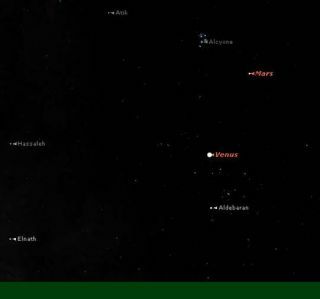 Mars will pass about 4 and a half degrees north of the beautiful Pleiades star cluster on the morning of July 12. And if you train binoculars toward it on the morning of July 20, you'll find it sitting very close to the fifth-magnitude star, Omega Tauri. On July 27, Mars will shine at magnitude is +1.2 and will lie 5-degrees above and to the left of Aldebaran, making this a good opportunity to compare Mars and Aldebaran (magnitude +0.9) in brightness and color. This month many will be keeping a night-to-night watch on the Moon as it makes a steady march toward the sun's position in the sky en route to a total solar eclipse on July 22. Several mornings earlier, on the morning of July 18, looking east-northeast a couple of hours before sunrise, you'll see Mars about 4-degrees below and to the right of a fat waning crescent Moon. The Pleiades will lie a similar distance above and to the right of the Moon, adding to this beautiful array. And on the following morning, the Moon will have moved on to the east, passing well above and to left of Venus. Venus in . . . Orion? When July comes to an end, Venus will have moved out of Taurus and will reside in the constellation of Orion the Hunter. This may sound odd, since Orion does not belong to the zodiac, but Venus is currently traveling south of the imaginary line in the sky that marks the Earth's journey around the Sun (the ecliptic) and will briefly reach into the boundaries of Orion on July 30 and 31, passing through the Hunter's club. This is not overly unusual, and occasionally; the Moon or a planet will wander through the club. Astrologers recognize twelve zodiacal constellations, and yet Orion . . . the brightest of all the constellations . . . is not one of them!